Catholic church statements on climate change are undermining the moral authority of catholic Prime Minister Tony Abbott and his government's poor record on climate action and support for fossil fuels and expansion of coal. Tony Abbott's 'coal for prosperity' statement is looking more ridiculous and out of step with every passing moment. Our Prime Minister was closely asociated with Cardinal Pell, a strong climate denier in the Australian Catholic Church. (See Graham Readfearn: Cardinal Pell’s mine of climate misinformation) Unfortunately Pell's climate ideas are not widely held in the upper echelon of the Catholic church. With the Paris climate talks approaching in December, 2015, Pope Francis has indicated that a papal encyclical on the environment and climate change is being prepared for issue. This will lay the moral ground and support for progress at the UN climate talks, according to Neil Ormerod, Professor of Theology at Australian Catholic University, writing in The Age in Januray, 2015. Papal encyclicals are doctrinal documents distributed to Bishops and priests with the teachings communicated to the 1.2 billion catholics. An encyclical on climate change will articulate the strong moral grounds for taking action on global warming, placing pressure on politicians to step up action. This will throw the Catholic Church's moral authority behind efforts for rapid greenhouse gas emissions reduction and an ambitious agreement in Paris in December. Pope Francis will also convene interfaith meetings of leaders of world religions to enhance the moral authority to take action. 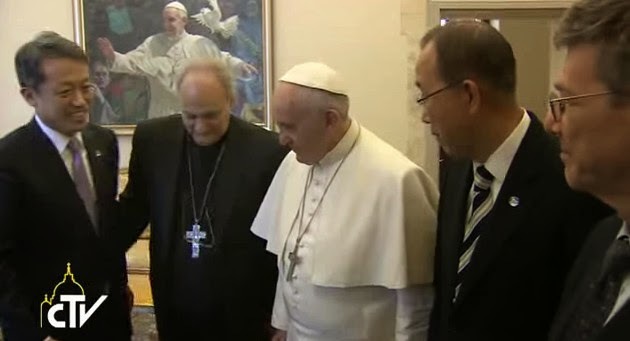 Pope Francis met with UN Secretary General Ban Ki-Moon and leading scientists, including economist Professor Jeffrey Sachs, and and the Italian President Sergio Mattarella at the Vatican. The meeting was held in conjunction with a Workshop, entitled “Protect the Earth, Dignify Humanity: The Moral Dimensions of Climate Change and Sustainable Humanity”. The workshop was organized by the Pontifical Academy of Sciences, the Pontifical Academy of Social Sciences, SDSN and Religions for Peace at the Vatican on 28 April, 2015. A sideshow at the Vatican was a delegation organised by the Heartland Institute to convince the Pope and the pontifical academies that they are wrong on global warming. According to DesmogUK report "The increasingly eccentric Lord Monckton played ringmaster to Dr Calvin Beisner of the Cornwall Alliance and Marc Morano from CFACT in a curious performance hosted by the Heartland Institute." UN Secretary General Ban Ki-Moon addressed the Vatican workshop saying, "Climate change is intrinsically linked to public health, food and water security, migration, peace and security. It is a moral issue. It is an issue of social justice, human rights and fundamental ethics. We have a profound responsibility to the fragile web of life on this Earth, and to this generation and those that will follow." He articulated that science and religion are not at odds on climate change, they are well aligned. "Our response has to be global, holistic and rooted in universal values. Climate change affects us all, but not equally. Those who suffer first and worst are those who did least to cause it: the poor and most vulnerable members of society." he said. "Climate change affects us all, but not equally. Those who suffer first and worst are those who did least to cause it: the poor and most vulnerable members of society." "Many countries are moving down a low-carbon pathway and investing in clean energy that can power truly sustainable development. To transform our economies, however, we must first transform our thinking, and our values. In this, the world’s religions can provide valuable leadership. As the Holy See has said, 'there is a moral imperative to act, for we all bear the responsibility to protect and to value creation for the good of this and future generations'." In his speech he outlined that Pope Francis will address the United Nations Special Summit on Sustainable Development in New York in September. He was also upbeat about the necessity in December for governments meeting in Paris at the UNFCCC climate talks to forge a meaningful universal agreement on climate change. "Paris is not the end point, but it must be a turning point in finding a common way forward in meeting the climate challenge." he said. "We are the first generation that can end poverty, and the last generation that can avoid the worst impacts of climate change. Future generations will judge us harshly if we fail to uphold our moral and historical responsibilities....This is a future in which we are good stewards of our common home and good neighbours to all. I am grateful for your moral leadership, and thank you for your commitment." concluded Ban Ki-Moon. All sectors and stakeholders must do their part, a pledge that we fully commit to in our individual capacities.